One of Scotland’s most popular artworks will be on display in the Outer Hebrides in the coming weeks. Thirty panels from the Great Tapestry of Scotland will be on show at Sgoil Lionacleit on Benbecula from November 14 to December 22. The 466ft tapestry, which is the brainchild of bestselling author Alexander McCall Smith, depicts the history of Scotland from the geological formation of the landscape to the reconvening of the Scottish Parliament in 1999. One of the nation’s largest community arts projects, the story is told in 159 boldly designed and intricately stitched panels that are the work of more than 1,000 stitchers of all ages from across Scotland. 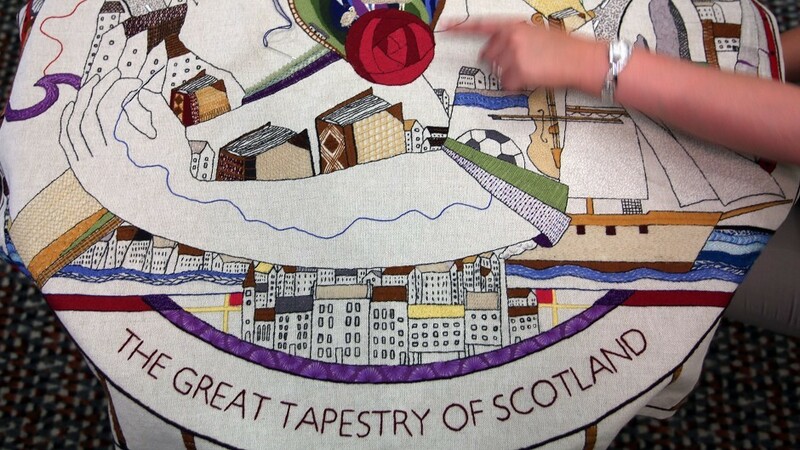 Since its hugely popular debut exhibition at the Scottish Parliament in September 2013, more than 325,000 visitors from all over the world have visited tapestry exhibitions at venues including the Scottish Parliament, Stirling Castle, Paisley Thread Mill, New Lanark, Aberdeen Art Gallery, and Ayr Town Hall. Mr McCall Smith was pleased that its next stop would be the Western Isles. He said: “I am delighted that The Great Tapestry of Scotland is coming to the Western Isles. The Western Isles have made a great contribution to the history of Scotland and this is reflected in a number of the tapestry’s panels. The project’s co-chairman and historian, Alistair Moffat, said: “This is a history of all of Scotland, and one that attempts to compass not only the whole nation but also all of its people as it tells the stories of shepherds, weavers, ploughmen, crofters, fishermen and all of the people who made our story come alive. Five of the tapestry’s stitchers are residents of the Western Isles. Margaret Macleod and Mary Macleod, the Lewis Stitchers, combined to make an early panel representing the visit of the Greek traveller Pytheas, who took a reading of latitude at Calanais in the fourth century BC. A stitching group who named themselves ‘The Sea-Mistresses’ worked on the panel depicting the loss of HMY Iolaire in 1919. This group consisted of Tracey MacLeod and Gillian Scott-Forest from Harris and Moira Macpherson from South Uist.